My Mum dropped something on my foot! She dropped that pot – it weighs a lot! And Mum she gave my head a pat. And now it doesn’t hurt one bit. This entry was posted in Me! Me! Me!, Things What Rhyme and tagged Miniature Schnauzer, Miniature Schnauzers, Poetry, Strem of Consciousness Saturday. Bookmark the permalink. Cute poem and dog. I also like that fence in your picture. It looks like it’s made of old car fenders and a railroad track. 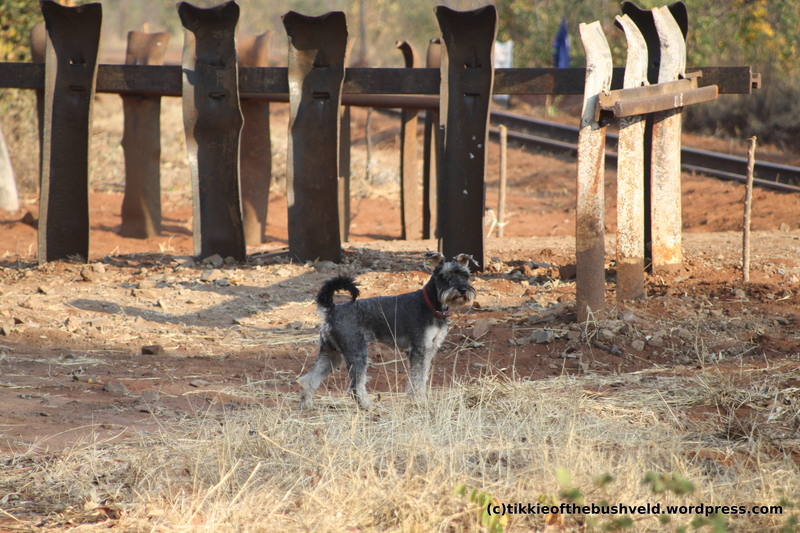 The fence is a kind of barrier that runs along where the road crosses the railway track that cuts through our farm. I Love walks along that road but Mum won’t take me there on Wednesdays – that’s when the train comes. I would probably be frightened. A lovely poem by a very handsome poet!